This is nice! It is a 1910 era color postcard view. Card front reads "Newport Trust Company , Newport , R. I. ". It pictures the old bank building with tall pillars out front. A horse and carriage sit out front. To the right is another business with striped awning that reads "Cigars". A neat old Rhode Island postcard view! Back is divided and is postmarked "Nov 12 1918 New Bedford Mass.". Back is handwritten in pencil. Condition is very good as shown with light edge wear. No creases or tears. Any other lines or waves are from the scanner and not on the actual image. Your item is shipped to you safely in a rigid mailer. Here's an interesting card. It pictures an early windmill in a grassy field. 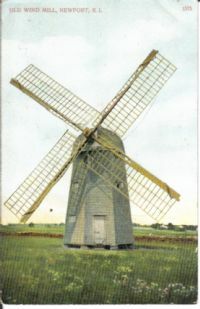 The front reads "Old Wind Mill , Newport , R.I.". Back is divided and postally unused, but written on. card dates to around 1915 or so. Condition good with light edge wear and smallest of corner crease at lower left. Here is a nice early soda fountain and drug store interior view from the Earnshaw Drug Co in East Greenwich RI !!! Clearly shows the soda fountain, drug store counters and seating area. Back is divided and postally unused. Condition very good! A nice one!